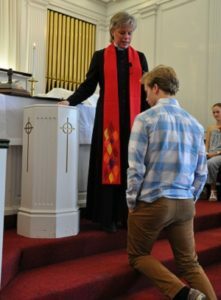 In the United Church of Christ, and at the Congregational Church of Hollis, we recognize and celebrate two sacraments: baptism and communion. These two ancient practices are rooted in Jesus’ own experience as recounted in the Bible. Jesus’ ministry began with his baptism in the Jordan River; and in his final days, he instituted the sacred meal we call communion (also called Eucharist or the Lord’s Supper) at a table with his closest disciples. A sacrament is an outward and visible way of representing something we experience as an invisible, inward spiritual grace. It’s a practice where our human senses help us to comprehend and express God’s incomprehensible love. Our sacraments—employing water, bread, and juice—remind us of the holiness of ordinary, everyday elements in our lives. And by transforming these mundane elements, we are reminded that ordinary lives are also transformed by God’s blessing and presence within them. 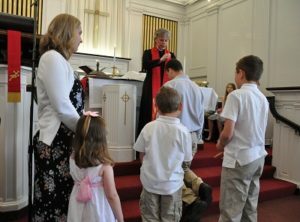 At the Congregational Church of Hollis, we do not set age limits on who may come for baptism (we baptize infants through elderly adults). We only expect that those who are taking the vows of baptism intend to live into the promises they make. Click HERE for a copy of our liturgy for baptism. 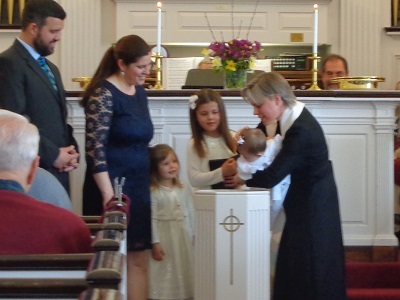 We are very happy that you want to have your child baptized in the Congregational Church of Hollis, and we want to be part of the joy and celebration at this very important point in your family life. 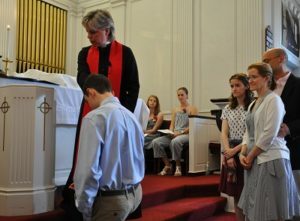 Since baptism is a rite of entry into the church, it is intended that at least one parent be an active church member. The church’s concern is for the child, that the parents, through their commitment, provide their child with an exemplary life of commitment to Christ and his church. Baptism is a symbolic act of our church family. As such, it has at least three aspects which should be under-stood by parents and god-parents or sponsors in order for you to better carry out the commitments which are involved. First, the church celebrates the fact that God loves your child quite apart from anything that he/she (or you) could do to deserve that love! We believe that in the divine order of events, our lives have worth because we all belong to the family of God. This is strikingly seen, for example, in the Biblical accounts of Jesus’ approach to people. He invariably reached out to them, just as they were, taking children in his arms and inviting all manner of men and women to dine with him. Baptism is an act of rejoicing and thanksgiving because God takes the initiative in coming to us. The brightness of baptism is the great joy of knowing that God loves your child and offers him or her the possibility of living as a child of his Kingdom. Thus, baptism is not a “giving away” of your child to God, but rather, we thank God that your child is his already. Second, in baptism, children are publicly received by a community of Christians who pledge that they will express God’s love in concrete ways. Neither human love nor divine love is ever a vague generality. Our Lord, for example, did not simply dispense sweet sayings; he lived out God’s love for us and God’s demand up-on us. And the church exists to continue this work of redemption and of calling us to fullness of life. Children are baptized, therefore, with the prayer that they will come to accept for themselves what Christ has done for them and that they will be instruments of God’s blessing in the world. 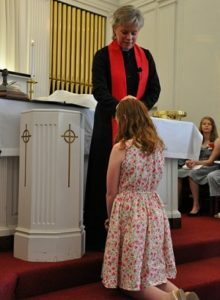 Baptism is also properly celebrated within the regular service of worship. It is not simply a private rite for the family and invited guests. In the course of the service, the members of our family of faith vow to support you in providing appropriate environment and education to help your growing child know God as revealed in Jesus Christ. They promise to pray for and with your child and your family, and to guide, support, and encourage you in your commitment as parents. The words and action of the service of baptism are directly related to these declarations. There are two primary symbols. Water symbolizes cleansing or forgiveness. It also signifies our entrusting ourselves to God so that he may work in us for his purposes. This is our faith, our response to God’s initiative. Laying on of hands symbolizes the gift of the Holy Spirit, God actively working in us. These two symbols are inseparable, for baptism means both cleansing and flooding with new life.